The Double O Retreat is located in the beautiful hills of West Virginia's Panhandle. It is centrally located between Baltimore (130 miles), Washington, D.C. (110 miles), and Pittsburgh (150 miles). 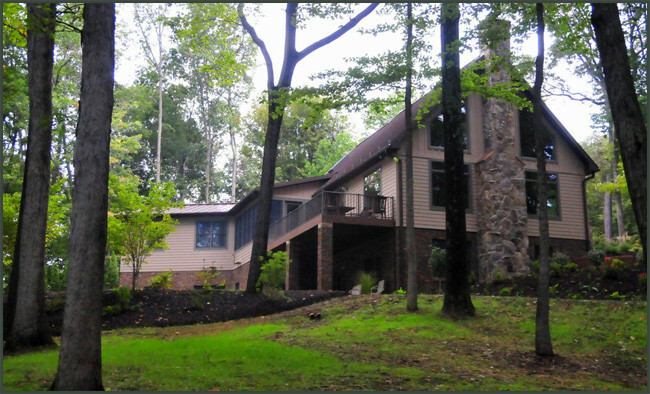 The retreat is nestled on 60 wooded acres and features glimpses of the mountains throughout. It is a comfortable yet contemporary setting for you to relax and enjoy yourself. All of your meals will be prepared for you daily onsite using local fresh produce, cheeses, and meats whenever possible. We will work with you to design a tailored menu specifically for your group or let us prepare a range of delicious foods. The Retreat is a gathering place for you and your friends to meet and spend time doing the activities that you love such as quilting, scrapbooking, painting, or any other creative activity you can imagine. Perhaps a nature weekend is more the reason for your get-away; fill your days with biking, kayaking, or hiking. If total relaxation is your goal then focus yourself with yoga or meditation. Bring the equipment you need and we will provide the rest for you and your friends.